Fascinated by the night sky? Want to know and see more? 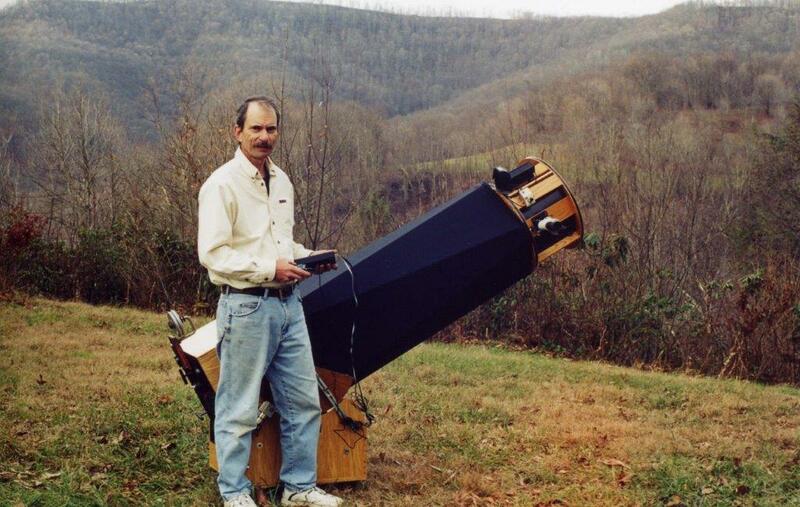 Now you can hire David Buhrman, an amateur astronomer and his telescopes to show you the heavens above. WV sky tours has a dark site twenty miles north of Lewisburg, WV. From this site the unaided eye can span the sky and make out the "Milky Way" band of the vast pin-wheel shaped galaxy in which we live. Meteors, satellites, and faint nebula can be picked out among all of the northern constellations visible any clear night when the Moon does not overpower. The Moon is itself a wonderful telescopic object, and the planets can be viewed even during the full Moon. Daytime astronomy is fun. Observe the granulation, limb darkening, facula, and sunspots on our closest star, the Sun. Learn how this nuclear powerhouse (containing 99.86% of our local solar system's mass) was born, lives, and will finally die. 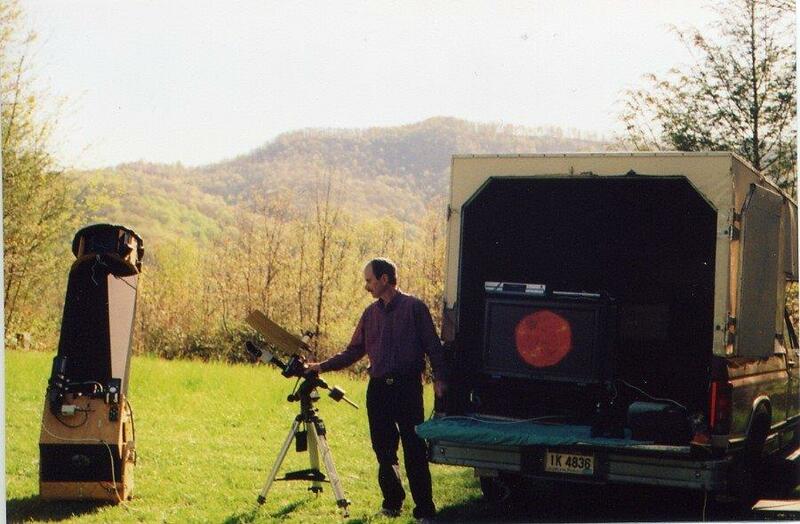 For larger groups, or greater distances, WV sky tours can bring the telescopes to your location. Make sure the site is suitably dark at night and permission has been granted ahead of time. Cloudy weather will dictate rescheduling a night sky tour. Or, an alternative indoor activity such as STARLAB or a video "slide show" narrated by yours truly, David Buhrman can be substituted. The Nightsky Truss Dobsonian has a premium 15" wide Royce mirror capable of gathering 3000 times the light of the human eye. This "light bucket" has been fully computerized to GoTo and track thousands of celestial objects, planets, and man made satellites. Two "integrated video" cameras mounted at the eyepiece of each scope produce a composite image of "streaming live video" in real time on a portable television monitor. A true "classroom experience" is achieved when everyone can see and discuss the bright, focused, image on the monitor. 80 mm Vista refractor mounted on the Nightsky's mirror box affords breathtaking wide fields of star clusters and the Moon. Our Coronado PST dedicated solar telescope equipped with Denkmeier Binoviewers will reveal magnificent daytime views of the Sun viewed in the Hydrogen-alpha wavelength. Celestron 8"SCT tracking telescope (not shown) can be set up to offer individual visual views of planets and the moon. Astronomical quality binoculars mounted on tripods or with neck straps available for a quick view of the sky. As an informal educator, I avoid getting bogged down in technical details that are beyond the scope of someone just trying to learn about the night sky. The first known science on Earth was star-gazing. The earliest cave drawings have star groupings in them. People read of fantastic discoveries everyday about the Universe and our place in it. I want to share my enthusiasm for the starry night with others. Let me untangle some of the mystery and help explain the why, where, and what that propels the sky above. What at first just looks like a dim smudge of fuzzy light in the eyepiece becomes more significant when you realize those photons that just collided with your eye left a galaxy larger than ours and have been traveling at 186,000 miles/second straight thru deep space for over 50 million years to arrive at this moment. A telescope is literally a "time machine." There is an abundance of sky lore and stories from every culture throughout history pertaining to the stars. Agrarian societies recognized early on that the fixed stars come again "like clockwork" every year. Ocean faring sailors depended on them for navigation. Learn how the constellations were named for the earthly events coinciding with their arrival. Why the week has seven days. How the "drinking gourd" showed the runaway slaves the way to freedom. Why the sky is blue, and sunsets are red. Find your place in the Universe. Written Permission is required prior to reproduction in whole or any part. All rights reserved.